Hey guys, I tried the mod to make my side markers act as turn signals. Basically I cut the black wire coming from the side marker light and spliced it into the blue(ish) wire from the fog/turn lights. This did not work for me. I have the RKSPORTS front bumper so there is no connections on the fog/turn signal light connector, would this be the problem? What are my other options on how to get some kind of turn signal? Is there a connector piece I can buy to allow me to again use the correct turn signal bulb, as I do not have that anymore. I just have this grey piece. Yep. That mod depends on the front bulb turn signal filament acting as a path to ground, so it wont work for your situation. Which would be easiest? What would I connect a bulb to? Is there a connector I can get that goes into that grey connector to be able to put an actual turn signal bulb? Btw thank you for all that you do for this forum! Do you still have the bulb holders (from the original bumper/light assembly)? If so, just plug that in to the grey connector and put a turn sig bulb in the socket. Otherwise, you'd need to connect a bulb (or ~6ohm power resistor) between the blue wire and black wire in the grey connector. You could try one of those resistors sold for LED 'hyper flashing'. Obviously need to do this on both sides. 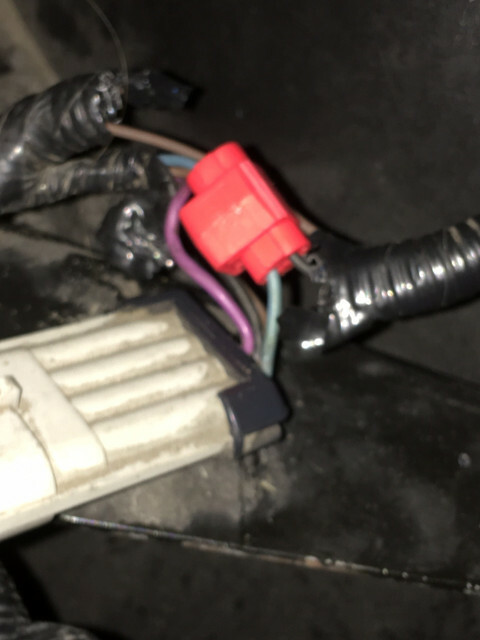 I would splice into the blue and black wires from the fog/turn signal grey connector. Does it matter if I splice the one before or after the splice from the side marker? That should work, and no it doesn't matter before or after. I actually just remembered I have 2 brand new fog/turn housings unopened. I opened them up, took the harness and connected it to the grey connector. So it works just fine with the original bulbs it came with. I have a pair of 3157 switchback LEDs I tried to put in place of the turn signal bulb. But it would not work. It only stayed amber color and then would not blink when I used the turn signal....also, I believe it caused even the side marker to not blink ...any ideas? Yes. LEDs will not work. They have no static path to ground since they are active devices. You need filament bulbs or a standard resistor - as I said.